Requires the disc; see Play without the CD for a workaround. 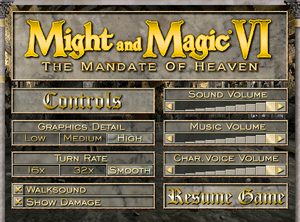 Included with Might & Magic X - Legacy Digital Deluxe. 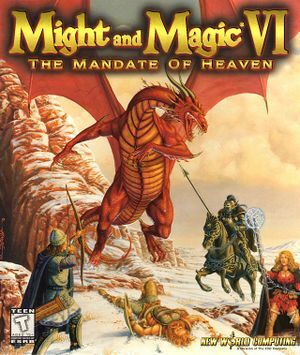 This game is included in the Digital Deluxe edition of Might & Magic X - Legacy. The GrayFace MM6 Patch fixes many gameplay bugs, while adding optional new features (such as always run and optional mouselook). The MM6 Controls addon allows for the changing of keyboard bindings; extract it into the installation folder and run it. Right click the game's shortcut and choose Properties. Add -nomovie at the end of the Target. Click OK. This shortcut will go directly to the main menu. Install the GrayFace MM6 Patch. Run the game to generate mm6.ini. Open MM6.ini and ensure NoCD= is set to NoCD=1. This disables CD music; to use MP3 music instead see No music (GrayFace MM6 Patch). Toggle with F4; needs 16-bit color unless using the GrayFace MM6 Patch. No apparent framerate cap. Certain graphic elements (such as the flames in the party creation screen) move at a pace tied to framerate. Sound, Music and Character Voice. Sound controls MP3 music volume. Using the GrayFace MM6 Patch with the NoCD option stops music playing so you will need to use MP3s instead. Go into the Sounds folder in the installation folder. Move the music files (2.mp3 to 16.mp3) to the Music folder. Save your changes. The music will now play in-game. Rip the Play disc music tracks in MP3 format. Rename them to 2.mp3 through 16.mp3. Make a new folder in the installation folder called Music and put the MP3s there. ↑ 2.0 2.1 File/folder structure within this directory reflects the path(s) listed for Windows and/or Steam game data (use Wine regedit to access Windows registry paths). Games with Steam Cloud support may store data in ~/.steam/steam/userdata/<user-id>/243380/ in addition to or instead of this directory. The app ID (243380) may differ in some cases. Treat backslashes as forward slashes. See the glossary page for details.